Potts: You'd never hurt another cop, would you, Frank? 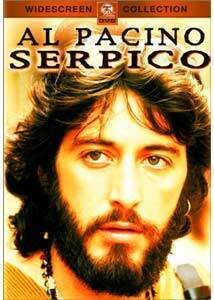 Serpico: It would depend on what he did. Potts: That's the wrong answer, Frank. It's a weirdly auspicious moment to revisit Serpico—on the one hand, the institution against whom the title character battles, the New York Police Department, is still (rightly) basking in the glow of the heroic efforts of some of its members after the attacks of September 11th. On the other, with Time Magazine's announcement of its 2002 Persons of the Year, a trio who went public about malfeasance at their respective institutions (Enron, the FBI, and MCI WorldCom), whistle blowers may never have been more lauded than at this time, and Frank Serpico could serve as their patron saint. Made between the first two Godfather movies, Serpico was the role that established Al Pacino as a certifiable movie star, and as a versatile actor, more than just Michael Corleone. (There's a certain irony inherent in how Paramount, the studio that fought Francis Coppola at every turn about casting Pacino in The Godfather, marketed this movie basically by repeating, "Pacino, Pacino, Pacino.") And the lead performance is a terrific one, a moral man in an immoral world—no doubt there are those in the NYPD who would quibble with the portrait of the institution, but cinematically, it's a triumph. The pre-Serpico NYPD is portrayed as hopelessly square, undercover cops wearing white socks with their black shoes and their buzz cuts, looking for all the world like nothing but the cops they are. And when Serpico's precinct gets an orientation about marijuana, it comes in the form of a speech from a sergeant that may as well have been lifted straight from Reefer Madness. The movie also seems to have established the visual style for decades of cop shows, most notably—and unsurprisingly—NYPD Blue. Director Sidney Lumet shoots New York as well as anyone, and even though "gritty" is an overused adjective in this context, it applies to the look of this movie, which pulses with the life of the city in the early 1970s. Lumet is also obviously gifted in working with his actors—no doubt he steered Pacino in the right direction (as he would again on Dog Day Afternoon), and the movie is peppered with terrific little performances by notable character actors, including Tony Roberts, John Randolph, F. Murray Abraham and M. Emmet Walsh. The one marked weakness is the depiction of Serpico's personal life—his first girlfriend travels in countercultural circles, and loves the novelty of introducing her boyfriend the cop; Serpico's second on-screen relationship, with a neighbor, quickly descends into screaming and recriminations. I suppose the filmmakers felt as if they needed to be able to cut away to something, but the personal side of the story isn't especially gripping, and given that the women are portrayed sketchily at best, you may find yourself itching for the movie to return to the precinct house. Image Transfer Review: The color palette is rather dark and somber, befitting the subject matter, but occasionally with this transfer it looks more muddy than moody. Generally, though, the black levels are solid and true, and there's little or no debris interfering with the image quality. Audio Transfer Review: A 5.1 track seems to have been remixed recently, for the purposes of DVD, and I don't know that it's much of an improvement over glorious old mono. In the effort to create some spatial dynamics in the sound, the 5.1 mix can sometimes be hard to make out, especially when the action of a scene is shot from a distance. But both audio tracks are more than acceptable, with only a marginal amount of hissing and buzzing. Extras Review: The four featurettes can essentially be thought of as one extended look at the making of the film, featuring the director, Sidney Lumet, and the producer, Martin Bregman. In the first, Serpico: Real to Reel (09m:56s), Bregman recounts the origins of the project—John Avildsen was the first director on it, but that old reliable, creative differences, led to his departure; Lumet inherited the film, with a first draft of the screenplay by Waldo Salt that would have run four hours. Next is Inside Serpico (12m:52s), in which Lumet recounts his rapid filmmaking style, very much in contrast to that of Francis Coppola on The Godfather. Serpico: Favorite Moments (02m:37s) consists of, you'll be shocked to learn, Bregman and Lumet recounting their favorite moments from the movie. Playing under a still gallery (04m:22s) is an extended Lumet anecdote on the film's score, by Mikis Theodorakis—it doesn't have much to do with the pictures we're looking at, and Lumet is such a skilled raconteur that it's a great disappointment that he didn't sit for a feature-length commentary track. A classic cop drama that set the tone for many stories in the genre that followed, Serpico is a spiffy little DVD, though the relative sparseness of the extras is a disappointment.